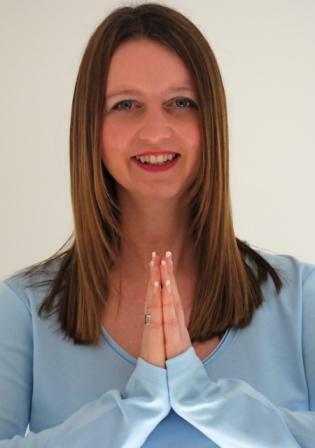 Jennifer Bentley is a fully qualified British Wheel of Yoga teacher who teaches students at all levels and abilities. Her style is sensitive to individual needs and follows the teachings of Desikachar, founder member of the Associaion of Yoga Studies or a style known as Viniyoga. Based in North Kent, Jennifer holds weekly classes at Beechen Hall in Walderslade Woods as well as holding personal one-to-one sessions for people with a unique need. She also runs regular Yoga workshops and Yoga retreats designed to reconnect you with the important things in life. My students come from Kent, Sussex, Surrey, Somerset, London and New Zealand! I started practising Yoga as a result of a back injury in my late teens and in my early twenties I moved to a new house and my neighbour (an ex Yoga teacher, what a lucky find!) encouraged me to attend a local class as she believed it would help. How right she was. When I started I couldn't touch my knees let alone toes! I have now been practising Yoga for 21 years and after 10 years of practising my teacher suggested that I should train to be a Yoga teacher, but I thought only "bendy" people could teach. My teacher explained enthusiasm for the subject was far more important and looking back she was absolutely right. I still have the same teacher today and she remains an inspiration to me and to those that she teaches. I am also more bendy! I am comitted to continuous professional development and as a result have gone on to specialise in teaching people with bad backs, ME, arthritus and mental health issues, such as depression etc. I also teach Yoga for sports enhancement. Yoga had helped me so much I want to pass the "magic" on. I have not only experienced a physical but a mental benefit too, feeling calm, in control, and well quite simply more happy! It really is amazing and the more you practice the more you gain and become able to pass on your vibrance and good vibe to others around you. Yoga is an excellent form of exercise for people looking to improve muscle tone in a relaxed and gentle way. For this reason Yoga is attractive to people of all ages and from all walks of life. If you are looking to develop an ongoing level of health and vitality, then come to my class. This is an excellent investment of your time, and for such a small cost you will become fitter, stronger, more supple, more youthful in appearence and take away relaxation techniques that you can use every day in your daily life. My regular Yoga breaks are becoming more and more popular. Coming away for a weekend retreat is an excellent way to take some time out from the stresses of modern life, and become grounded again. I have had nothing but positive feedback from people coming to my retreats, and this is because I invest so much attention to detail in making sure everything is as perfect as it can be - so that all you need to do is turn up, and be looked after for the whole time until you leave. My Yoga retreats provide the perfect opportunity for you to experience Yoga in the way that it is meant to be. Yoga is a daily exercise, that gets your metabolism going, detoxifies the body, and creates a natural calm within you that in turn brings both mental and physical strength. My Facial Yoga is growing in popularity too. There are very few Yoga teachers who are able to teach the correct postures and exercises to improve tone and suppleness around the eyes, mouth, forehead and neck. In the USA, Facial Yoga is the latest trend being taken up by celebrities - but this is all based on practises that have been developed and used for thousands of years! The reason for the sudden growth in popularity is due to the fact that Facial Yoga is less expensive than cosmetic surgery and doesn't carry the same dangerous health risks associated with invasive chemicals such as Botox. My private 1:1 sessions provide the best way for people to master the many postures and asana's available in Yoga - each one having their own specific health benefit. Most of my private sessions are with people who have been referred to me by their GP because they need help with a physiological problem, such as back pain, neck pain, problems with joints or perhaps they suffer from stress and anxiety. In a 1:1 session the focus is 100% on you and the session is tailored to improving your own physical and mental health and well being.